eg. 100 µl of in vivo-jetPEI® delivery reagent is sufficient to perform 15 to 25 intravenous injections in mouse. in vivo-jetPEI® is the most advanced in vivo transfection reagent for safe and efficient in vivo delivery of any nucleic acid (eg. DNA, mRNA, siRNA, miRNA, oligonucleotides) in animal models. With a track record of over 700 publications, in vivo-jetPEI® is the consensual in vivo transfection method for in vivo functional studies, cancer research and immunization/vaccination. Table 1: Range of in vivo-jetPEI® quality grade reagents for each step of nucleic acid-mediated viral vector-based manufacturing. in vivo-jetPEI® is available as an R&D grade for fundamental research and proof of concept studies. For preclinical biodistribution and toxicology studies and early phase clinical studies, we supply a higher preclinical grade in vivo-jetPEI®. GMP in vivo-jetPEI® is the highest quality grade available to meet quality demands in Human clinical trials. Bulk quantities and GMP grade reagent are available upon request. Please contact us. The easiness of use and versatility of in vivo-jetPEI® allows scientists to perform gene function studies by overexpressing or downregulating a gene in any organ/tissue of interest. in vivo-jetPEI® is polyvalent: it is suitable for the delivery of any type of nucleic acid (plasmid DNA, siRNA, shRNA, miRNA, oligonucleotides and mRNA) in any animal model (mice, rat, guinea pig, dog, rabbit, monkey, etc…). Numerous Scientific publications demonstrate the successful delivery of each type of nucleic acid in different animal model. in vivo-jetPEI® has already been used to target a wide range of organs by systemic and local injection routes. Local administration routes include subcutaneous tumor, intracerebral or intra-articular injections and topical application. The injection route largely determines the targeted organs. For example, upon intravenous injection, in vivo-jetPEI®-mediated DNA delivery leads to gene expression mainly in the lung but also in the liver, pancreas, spleen, kidney, heart, bladder and artery. Conversely, upon intraperitoneal injection, the gene of interest will be expressed in the ovary, pancreas, diaphragm, uterus and stomach (Fig. 1). To achieve organ specific gene expression, cell-specific promoters can be combined with the choice of a local injection route to restrict gene expression to an organ/tissue. Guidelines for systemic and most local injection routes are available. Fig. 1: Organs targeted following systemic nucleic acid delivery using in vivo-jetPEI® in mice. Complexes were formed using 40 μg or 100 μg of luciferase expressing plasmid and in vivo-jetPEI® at an N/P ratio of 8, in 200 μl or 1 ml of 5% glucose and injected either through retro-orbital sinus (IV) or intraperitoneally (IP), respectively. 24 hours after injection, different organs were extracted and luciferase expression was measured or live imaging was performed using IVIS system (Perkin Elmer). in vivo-jetPEI® is the reagent of choice to deliver any type of nucleic acid using most systemic and local injection routes. 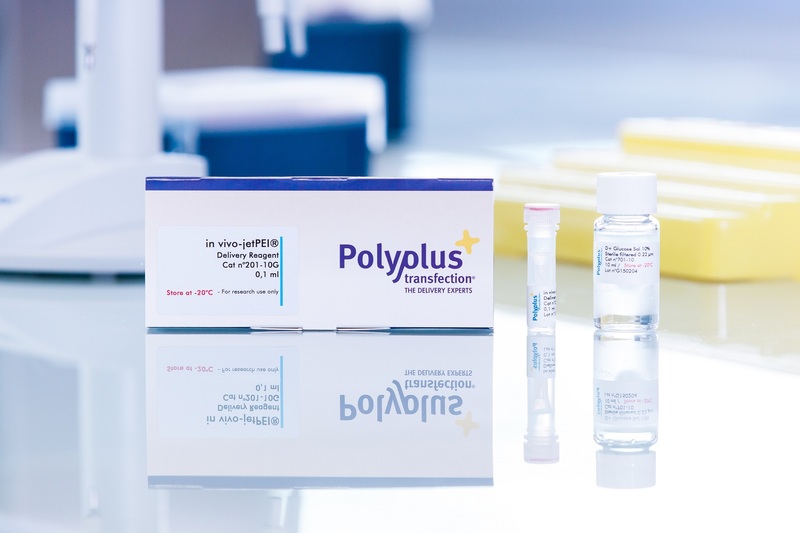 The protocol is easy to use and similar to a classical in vitro transfection: the nucleic acid and in vivo-jetPEI® reagent are mixed and directly injected into the animal model (Fig. 2). Fig 2: in vivo-jetPEI® protocol in mice. This two-step protocol is compatible with direct injection of in vivo-jetPEI®/nucleic acid nanoparticles though any systemic or local administration routes. Our delivery experts are available to adapt your protocol to your animal model and send you the relevant literature. 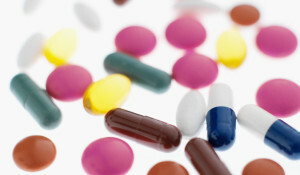 in vivo-jetPEI® is a powerful polymer-based reagent with unique properties. In the provided complexation solution, in vivo-jetPEI® condenses any nucleic acid into stable nanoparticles of ca. 50 nm diameter (Fig 1). 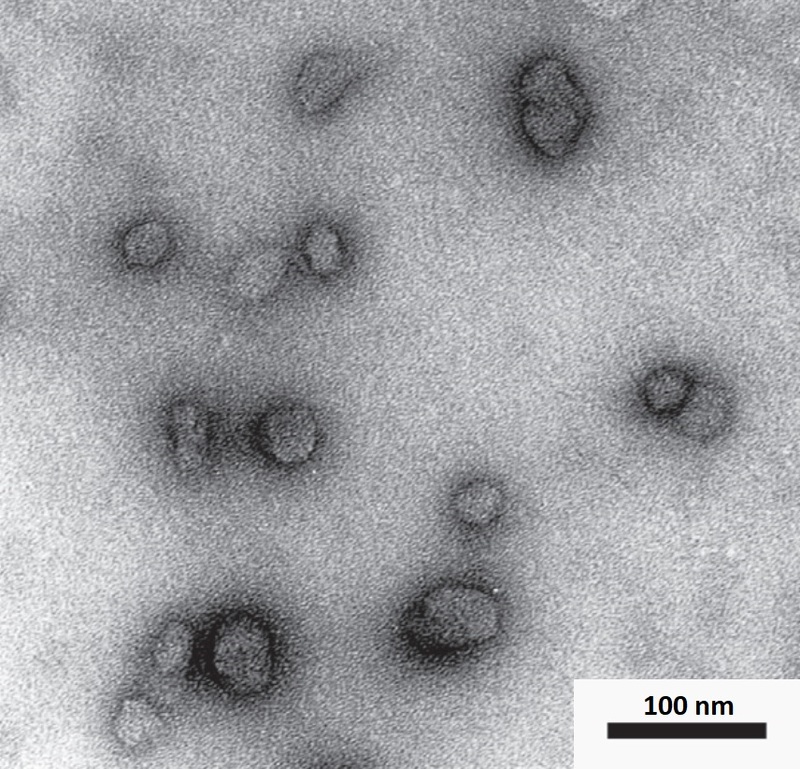 These nanoparticles are sufficiently small to efficiently diffuse within tissues and enter cells by endocytosis, while protecting naked nucleic acids from degradation. At the cellular level, in vivo-jetPEI facilitates both endosomal escape using the proton sponge mechanism (Akinc et al. (2005), J Gene Med 7: 657), and crossing of the nuclear membrane (Brunner et al. (2002), Mol Ther 5: 80). Fig. 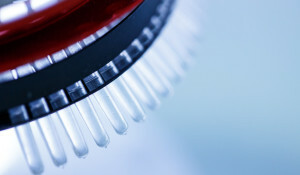 3 in vivo-jetPEI® forms small spherical particles with plasmid DNA. in vivo-jetPEI®/DNA complexes are prepared in 5% glucose solution at N/P ratio of 10. Complexes were added on a carbon covered grid and stained with uranyl acetate. Observation was carried out under a TEM. Bar is 100 nm. Complexes produced in glucose solution are discrete spheres having a mean size of 50 +/- 30 nm (Courtesy J-S Remy, Laboratoire Chimie Génétique, CNRS UMR 7514, Illkirch, France). Due to its reliability, in vivo-jetPEI® has been selected as a delivery vector for several drug development programs due to its safety and delivery efficiency. There are currently several ongoing clinical trials for cancer therapies, vaccination and immunization using higher quality grade cGMP in vivo-jetPEI®. If you have any questions regarding in vivo-jetPEI®, please visit our dedicated Frequently asked questions or contact us. in vivo-jetPEI® is perfectly suited to study gene function in vivo and provides the easiest method for the validation of in vitro functional studies into animals. in vivo-jetPEI®-based nucleic acid delivery is now widely used for tumor growth inhibition studies. As an example, the delivery of a modified siRNA against Cyclin B1 with in vivo-jetPEI® inhibits the formation of lung metastases (Fig. 4A) and in vivo-jetPEI® mediated delivery of a modified siRNA against Survivin prevents the growth of a tumor xenograft model (Fig. 4B). Fig. 4: Tumor growth inhibition following in vivo-jetPEI® mediated delivery of modified siRNAs. (A) Mice were injected intravenously with TSA-Luc cells forming exclusively lung metastases. 2 days after cell injection, the mice were treated intravenously with 1 mg/kg of STICKY siRNA™ against cyclin B1 (N/P=12.5). Bioluminescence imaging was performed 10 days after cell injection. Data from Bonnet et al., (2013), J Control Release 170(2) :183-90. (B) Mice bearing tumor xenografts were treated intravenously with 1 mg/kg of STICKY siRNA™ against Survivin (N/P=12.5). Tumor growth was monitored after each treatment and represented as a mean tumor volume ± SEM. Data from Kedinger et al., (2013), BMC Cancer 13:338. Following in vivo administration of plasmid DNA formulated with in vivo-jetPEI®, the expressed protein can elicit the induction of a robust and persistent immune response, hence protecting animals from different viruses or pathogens challenge. in vivo-jetPEI®-mediated delivery of CRISPR/Cas9 system targeting tumor suppressor genes provides a flexible and effective method to investigate somatic loss-of-function alterations and their influence on tumorigenesis. Wen, Q., Wu, S., Lee, W. M., Wong, C. K. C., Lui, W. Y., Silvestrini, B., Cheng, C. Y. (2019). Myosin VIIa supports spermatid/organelle transport and cell adhesion during spermatogenesis in the rat testis., Endocrinology.